With a name like Summerland, you know it’s got to be good. After driving 52 miles south of Solvang, we stopped to do our final road charge on Day 3 on our EV road trip from Silicon Valley to Malibu. And, what a place! After 13 hours on the road yesterday and a long night finding a motel in Salinas the night before, I confess I am ready to be at our destination already. 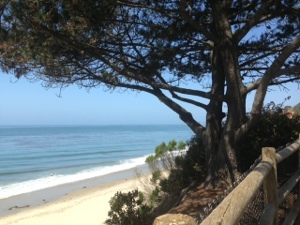 Still, if you need to charge for nearly four hours this spot at Lookout Park just south of Santa Barbara could not be beat. It looks out over the ocean, you can walk down the the sandy beach, and a hip little village of cafes, shops, and antiques shops are nearly across the street. There’s even a self service dog “spa” so you can hose off your dog and a playground for the kids. Immediately, the woman in the vehicle came to chat with us. She was more excited about our electric vehicle than the guy walking by with his dog who asked us how long my husband’s 2012 Nissan Leaf takes to charge. My husband was a little offended when the guy shook his head and walked away without a word. Obviously, the guy does not know what he is missing. 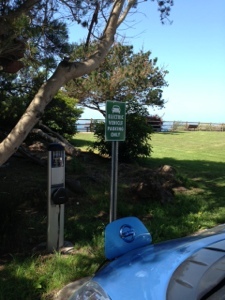 This ChargePoint charging station is right off Highway 101, and it cost us $1.72 to charge. There is a park caretaker who lives right next to the parking space and that provides extra reassurance that no one will mess with the car. Now, that we are so close to LA, there are plenty of charging options, so we did not map out our exact plan until we got in the car this morning. I hope that is a glimpse of what it will someday be like in other parts of America. We had hoped to go to Santa Barbara, but we needed a charger a little farther away from Solvang. When I saw Summerland on the PlugShare app, I was happy to see that it was at a strategic distance for us. We grabbed a leisurely lunch at Stacky’s Seaside Shack, checked out the shops and the tower garden, where produce is grown for local restaurants. Then, while my husband sat in a pocket park reading a book about the civil rights movement, I shopped for a new skirt. Under a sunny sky, with a gentle sea breeze, the time passed so quickly we almost didn’t make it back to the car before the charge was finished. I guess we are relaxed! Now, Highway 101 is filling up with holiday traffic and with 70 miles to go, we are keeping the AC off and driving in ECO mode because the last stretch is a 1,000 foot climb that will drain our juice more quickly. With any luck,our next charge will be at the inn we booked in Topanga Canyon, our final southerly destination. We picked the place because it has two charging stations and the canyon has an interesting Hollywood history, not to mention that Neil Young used to hang out here,and my husband is a big fan. I love seeing that hotels are installing charging stations, but I think it is important that they stay available to the public so that EV driving does not become an exclusive privilege. I will write more about this issue later. Meanwhile, the massages at the inn are booked. I think we earned them.